Input Tax Credit refers to the tax already paid by a person at time of purhase of goods ro services and which is available as deduction from tax payable . For eg- A trader purchases good worth rs 100 and pay tax of 10% on it. And now this trader sold such goods at Rs. 150 and collect tax of Rs. 15 from buyer. Now the trader has to pay Rs. 15 to government but he had already paid Rs. 10, so this Rs. 10 is ITC of the trader and will be allowed as deduction from tax payable and he has to pay net Rs. 5 as tax. Although availment of ITC is subject to certain conditions as covered in this article. SGST/UTGST payable or Input tax credit of SGST/UTGST will be calculated state wise i.e ITC of SGST in one state can not be utilized for payment of SGST of another state. 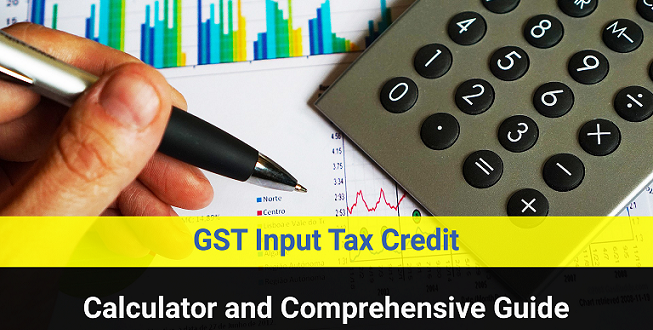 Input tax credit can not be used for payment of interest, penalty, fees or any amount payable under the act other than the GST in manner mentioned above. All registered person are allowed to take input tax credit other than person who are paying tax under composition scheme. A person who has applied for registration within 30 days from the date on which he is liable for registration is allowed to take input tax credit in respect of inputs held in stock and inputs contained in semi-finished or finished goods held in stock on the day immediately preceding the date from which he becomes liable to pay tax. A person who hast taken voluntarily registration is allowed to take input tax credit in respect of inputs held in stock and inputs contained in semi-finished or finished goods held in stock on the day immediately preceding the date of grant of registration. A person who has ceased to pay tax under composition scheme is entitled to take credit of input tax in respect of inputs held in stock, inputs contained in semi-finished or finished goods held in stock and on capital goods on the day immediately preceding the date from which he ceases to pay tax under composition scheme. Under the points 2, 3 and 4 above, the input tax credit is allowed only for the stock which is purchased in last one year from the aforementioned date. Such person needs to file Form GST ITC-01 within 30 days of his becoming eligible for availing input tax credit. Details furnished in the form is to be certified by a practicing chartered accountant or cost accountant if the input tax credit claimed is more than Rs. 2 lakhs. The person who obtains voluntary registration is entitled to take the input tax credit of input tax on inputs in stock, inputs in semi finished goods and finished goods in stock, held on the day immediately preceding the date of registration. Input tax credit is allowed only on purchases made for selling taxable or zero rated goods or services. ITC is not allowed for purchases made for exempted supplies. The input tax credit of goods and / or service attributable to only taxable supplies can be taken by registered taxable person. The amount of eligible credit would be calculated in a manner to be prescribed in terms of section 16(7) of the MGL read with GST ITC Rules (yet to be issued). It is important to note that credit on capital goods also would now be permitted on proportionate basis. Where the goods against an invoice are received in lots or instalments, the registered taxable person shall be entitled to take credit upon receipt of the last lot or instalment. Input tax credit of GST component of capital goods is not allowed if the person has claimed depreciation in income tax act for GST component. In other words ,a person can either take input tax credit of GST on capital goods or claim depreciation on tax component. (h) any tax paid in terms of sections 74, 129 or 130. If a person who is paying tax in normal scheme and wants to shift to Composition scheme or where goods or services supplied by him become wholly exempt, he has to pay credit of input tax in respect of inputs held in stock and inputs contained in semi-finished or finished goods held in stock and on capital goods, reduced by such percentage points as may be prescribed, on the day immediately preceding the date of exercising of such option or, as the case may be, the date of such exemption. After payment of such amount, the balance of input tax credit, if any, lying in his electronic credit ledger shall lapse. Where a recipient fails to pay to the supplier of goods or services, the amount towards the value of supply of goods/services along with tax payable thereon within a period of 180 days from the date of issue of invoice by the supplier, an amount equal to the input tax credit availed by the recipient shall be added to his output tax liability, along with interest thereon. This rule doesn’t apply where the recipient is liable to pay tax on reverse charge basis. Such person has to furnish such details in From GSTR-2 for the month in which such period of 180 days lapse. GST paid on reverse charge is also allowed as Input Tax Credit subject to the condition that it is allowed according to all other provisions. But note that reverse charge has to paid through cash only. Credit of tax paid on capital goods is also permitted to be availed in one instalment. Input tax credit of tax component of capital goods is not allowed if the person has claimed depreciation in income tax act for GST component. In other words ,a person can either take input tax credit of GST on capital goods or claim depreciation on tax component. Where refractory bricks, moulds and dies, jigs and fixtures are supplied as scrap, the taxable person may pay tax on the transaction value of such goods determined. Principal is allowed to take ITC of the goods or capital goods sent to a job worker for job work. Input is allowed even if the inputs are directly sent to a job worker for job-work without their being first brought to his place of business. If such goods are not received back by principal or supplied from place of job worker within one year from the date of sending goods to job worker, then it shall be deemed that such inputs had been supplied by the principal to the job-worker on the day when the said inputs were sent out. This limit of one year is increased to three years in case of capital goods. Where the inputs are sent directly to a job worker, the period of one year or three year shall be counted from the date of receipt of inputs by the job worker. This rule of deemed supply shall not apply to moulds and dies, jigs and fixtures, or tools sent out to a job-worker for job-work. Banks, financial institutions and non banking financial companies (NBFC) engaged in business of deposits, extending loans or advances have an option to avail an amount equal to fifty per cent of the eligible input tax credit on inputs, capital goods and input services in that month or to take Input tax credit only on purchases made for selling taxable or zero rated goods or services and leave out the tax paid on purchases made for exempted supplies. Option once exercised can not be changes during the financial year. Also restriction of 50% doesn’t apply where the tax is paid on supply from one registered person to another registered person having the same Permanent Account Number. WHAT IF SUPPLIER DID NOT FILE GSTR1 BY THE END OF 31.3.19 FOR THE MONTH OCT-MARC 17-18. The supplier can add such invoices in GSTR-1 of any month/quarter till due date of filing GSTR-1 of month of March or quarter of Jan to Mar. So if the supplier files monthly GSTR-1 then if he files his return by 11th April 2019 then also it will show in your GSTR-2A. If he files quarterly GSTR-1 then the date will be 31st April 2019. I PURCHASED BAGS AND TAKE THE FULL INPUT ON BAGS BUT NOW THESE BAGS ARE NOT USED FOR MY PRODUCTION , SO I WANT TO SELL THIS MATERIAL AS SCRAP WITH LOWER COST SO PLEASE CONFIRM ABOUT REVERSAL OF INPUT? NOW CONFIRM ABOUT REVERSAL OF input is compulsory if it is compulsory how much input to be reversed. There is no provision in CGST Act for reversal of input in case of sale of scrap. You need to pay GST on Rs. 50 (in your example). Input is not allowed and thus requirement to reversal in case of goods lost, stolen, destroyed, written off. And also reversal is to be made in case of capital goods.